We can easily accomodate up to 50 guests in our living room for a festive dinner and a lecture. The guests were greeted by our old dog Mefisto, a Golden Retriever. But unfortunately he is not with us anymore. Everybody receives a flyer with the menu. It changes according to the season. First you will get the very best and definitely the most beautiful Humous in the entire Middle-East. First we go through the menu. I try to use ingredients, which taste well, but which you probably never tasted or even heard of. Sometimes I experiment with new recipes, which might introduce you into the culture of the Middle East. 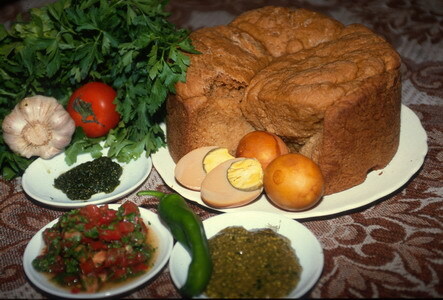 A speciality is a Yemenite shabbat bread, which is baked in the oven up to 24 hours. That is an opportunity to talk about the meaning of „kosher“ food. Because religious Yemenite Jews make it for their shabbat, you will never find it in a restaurant. 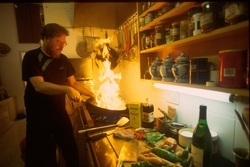 Religious owners of a restaurant would not open on the shabbat, but also would not cook shabbat food during the week. We will then talk about some biblical foods, like „Thou shalt not seethe a kid in his mother´s milk“. Once, in biblical times it was offered to the Gods in Lebanon. Until today it is a festive dinner among Arabs. 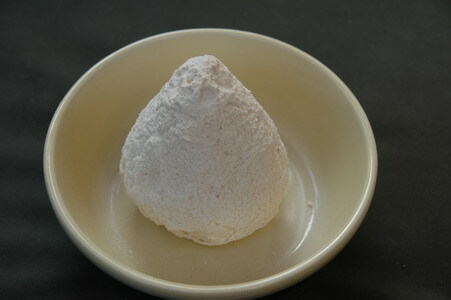 If you wish to have a kosher dinner, I will of course only talk about it and let you touch and smell the very special milk with which this meal is prepared (dried goat milk). Afters this, we turn to the buffet, where you can immediately try out everything and taste it. During dinner, I am open to any questions about the political situation in Israel and in the Middle East.